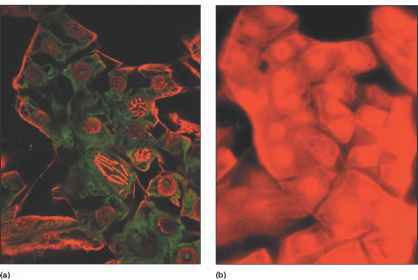 Microscopic observation; all cells in large square counted. Sample added here. Whole grid has 24 large squares, a total area of 1 sq mm and a total volume of 0.02 mm3. Used to determine total number of cells; can be used for those bacteria that cannot be cultured. Rapid, but at least 107 cells/ml must be present to be effectively counted. Counts include living and dead cells. Coulter counters and flow cytometers count total cells in dilute solutions. Flow cytometers can also be used to count organisms to which fluorescent dyes or tags have been attached. Used to determine the number of viable bacteria in a sample, but only includes those that can grow in given conditions. Requires an incubation period of approximately 24 hours or longer. Selective and differential media can be used to enumerate specific species of bacteria. Time-consuming but technically simple method that does not require sophisticated equipment. Generally used only if the sample has at least 102 cells/ml. Concentrates bacteria by filtration before they are plated; thus can be used to count cells in dilute environments. Statistical estimation of likely cell number; it is not a precise measurement. 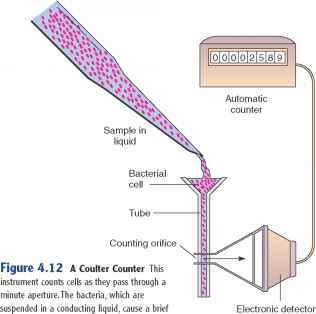 Can be used to estimate numbers of bacteria in relatively dilute solutions. Biomass can be correlated to cell number. Very rapid method; used routinely. A one-time correlation with plate counts is required in order to use turbidity for determining cell number. Tedious and time-consuming; however, it is one of the best methods for measuring the growth of filamentous microorganisms. Uses chemical means to determine the amount of a given element, usually nitrogen. Not routinely used. Methods are rapid but must be correlated to cell number. Frequently used to detect growth, but not routinely used for quantitation. Titration can be used to quantify acid production. A pH indicator is often used to detect growth. Carbon dioxide can be detected by using a molecule that fluoresces when the medium becomes slightly more acidic. Gases can be trapped in an inverted Durham tube in a tube of broth. Firefly luciferase catalyzes light-emitting reaction when ATP is present. ture (figure 4.12). The suspending liquid must be saline or another conducting fluid, because the machine actually detects and subsequently counts brief changes in resistance that occur when non-conducting particles such as bacteria pass by. Viable cell counts are used to quantify the number of cells capable of multiplying. These methods require knowledge of appropriate growth conditions for a particular microorganism as well as the time to allow growth to occur. They are invaluable for monitoring bacterial growth in samples such as food and water that often contain numbers too low to be seen using a direct microscopic count. change in resistance as they pass by the counter. 98 Chapter 4 Dynamics of Prokaryotic Growth that arise from a sample added to an agar plate. The most probable number method gives a statistical estimate of the number of cells based on a series of dilutions. With all of these methods, the numbers of particular species of bacteria can sometimes be determined by using selective and differential media.